This is NOT the way to manage your passwords! This new annual event has been created by Internet Tech Guy to remind you to change your passwords on a regular basis. Start with these tips and take action to celebrate Internet Change Your Password Day! Make your passwords at least 14 characters…really! Make your passwords a mix of letters, numbers and special characters. Make your passwords unique to each account – don’t use the same password over and over. 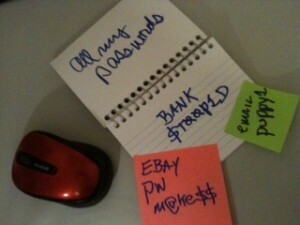 Manage your passwords in a secure way – sticky notes under your keyboard will not suffice. For more ideas on password management, see my earlier post below. What is YOUR password management system? I like Roboform – how about you?